Complete with a wide array of events ranging from a berry brain break, to a mental health open mic and massages, the Freshman Class Committee kicked off a more expansive “Freshman Health Week” this week than in previous years. In the third iteration of the initiative, freshmen Undergraduate Council representatives sought to include more aspects of health, including sexual, mental, and physical health. “[These elements are] all very interconnected in someone’s health, and I think that’s what we saw in conversations that we wanted to improve on,” Ivy Yard Representative Catherine L. Zhang ’19 said. Although the Freshman Class Committee began conceptualizing Freshman Health Week last fall, the team, under the direction of Committee Chair Eduardo A. Gonzalez ’18, officially started planning in early February. 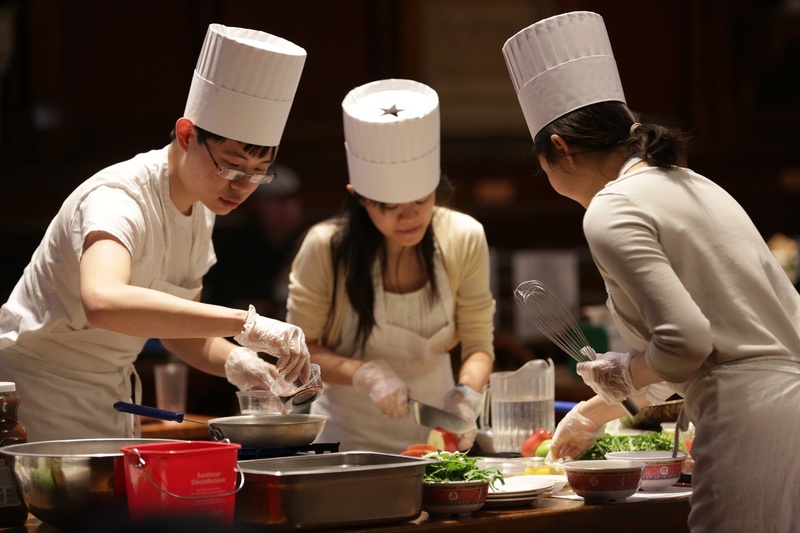 Students participate in the Food Literacy Cook Off at Annenberg Hall. The Food Literacy Cook Off is part of the Undergraduate Council’s Freshman Health Project. While the program last year featured one event per day, this year students could choose from two to three events most days, ranging from zumba, yoga, and a food-literacy cook-off to journaling, color-booking, and a petting zoo. The Freshman Class Committee paid particular attention to publicity and wide-ranging class engagement, utilizing social media and a promotional video to reach more students. “I think our publicity was successful because if you talk to freshmen, most of them are at least aware that this project is going on, and that’s our main goal,” Crimson Yard Representative Leah D. Stewart ’19 said. The committee members saw large turnouts for their events, “especially for events that are more largely focused, like the mental health open mic and the berry brain break,” Xiao said. Over 30 people converged in the Cambridge Queen’s Head pub for the mental health open mic on Tuesday. At the event, attendees told stories of overcoming various sexual and mental barriers, performed spoken word, and participated in joint sing-alongs, led by Zhang on ukulele. Some attendees said they were moved by the personal reflections. “When I walked in at 9:15 p.m. and saw a line way out the door, I was so excited. We do plenty of initiatives on the UC, and when you see a turnout like that, we were all just high-fiving each other. Really awesome feeling,” Stewart said. The coloring book event was another addition to the brain break, which many students praised. While the Freshman Dean’s Office was not officially involved in the planning, Interim Dean of Student Life and Dean of Freshman Thomas A. Dingman ’67 participated by judging a food literacy cook-off. “I think it’s a great thing for them to do,” Dingman said. Hundreds of freshmen crowded Annenberg Hall to enjoy an assortment of strawberries, blueberries, raspberries, and blackberries during Tuesday’s Brain Break, but some were left with just sour grapes.